What are the right safety and maintenance tips to set up in your plant? Why do they need to be in place? Regular maintenance on plants and equipment must be carried out to prevent problems developing, to make sure that any potential faults are corrected and to ensure all equipment is running safely, and effectively. The importance and objectives of maintenance management really shouldn’t be underestimated as they can make the difference between a smooth running operation or an accident waiting to happen. 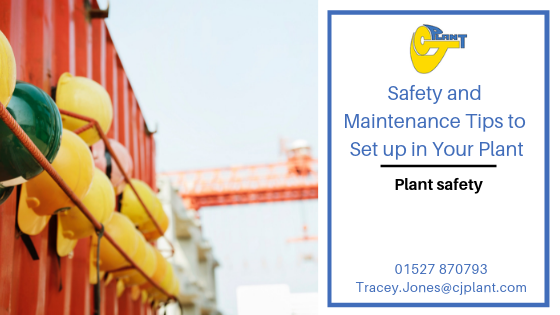 Plant maintenance can happen as part of a planned programme of repairs or may need to be carried out at short notice, if certain pieces of machinery or equipment have broken down. As a result of this, the activities that take place are non-routine based and can mean that those people who are involved are put at risk. Putting in place different types of plant maintenance and an effective plant maintenance and safety programme will make the entire plant and all its equipment more reliable. Ultimately this should mean fewer breakdowns occur and that there is a reduced risk of workers having to come into direct and sometimes dangerous contact with machinery. A plant that is well looked after will run smoothly. Hazards and accidents can occur when plant machinery such as hydraulic motors or hydraulic pumps become unreliable and develop faults. Hydraulic testing equipment and maintenance allow for these issues to be caught and diagnosed early to manage any potential risks. However, proper maintenance needs to be planned correctly and carried out regularly. Unsafe maintenance procedures can cause accident and injury, either during the maintenance itself, or to those people who are using the incorrectly maintained equipment. What Must Be Done to Ensure Plant Safety? If a tool or a machine breaks down during use. If a plant machine starts up unexpectedly. If there is contact with materials usually enclosed within the machine, that may have been caused by breakage, leaks or some other means. Working at height or undertaking work which might require entering an unused or unusual part of the plant. If entering spaces in which there may be a lack of air, or where toxic materials might be kept. Putting in place a planned programme of maintenance is a helpful step to reduce any risks, as well as making sure there is a procedure for workers to report problems that occur when they are working on machinery. Study machinery carefully and decide whether specialist contractors such as CJ Plant should carry the work out. Do not undertake work for which you have no qualifications or are not competent in. Careful planning of any maintenance work is essential. Produce a safe system of work, including a timeframe that considers workers and the machinery being repaired. This will avoid unforeseen delays and reduce the risks. All maintenance staff should have appropriate clothing, equipment and accreditation. Wherever possible, try and use downtime for maintenance procedures. For instance, carrying out essential work before start-up or during shutdown periods. It is essential that there is safe access to a site and a safe place of work for anyone carrying out maintenance and repairs. However, whilst it is important to consider the safety of maintenance workers, the safety of others who may be working nearby such as other employees or contractors is a serious consideration too. Signs and barriers should be put in place to let people know if there are areas that they should not enter. Make sure any moving plant has stopped. Isolate any power or electrical supplies, as maintenance work often needs to be carried out without electricity on. However, if work is to be carried out on or near to overhead electrical conductors with overhead travelling cranes, turn power off first. Machines should be locked off if there is any possibility power could be accidentally switched back on. Any plant or pipelines that contain pressured fluid, gas, steam or other hazardous materials should be locked off. Isolating valves should also be locked off. Anything that could release stored energy and could cause the machine to move such as compressed air or hydraulic pressure should be safely released. Parts of a plant that could fall, such as guillotines with blocks should be supported. Components that operate at high temperatures must be given adequate time to cool. Mobile plant should be placed in neutral gear. Brakes should be applied, and wheels should be chocked. Vessels containing flammable solids, liquids, gases or dusts, should be cleaned out and checked before any hot work is carried out. This is to prevent explosions. Specialist help from trained professionals may be needed to carry this work out. Make sure maintenance is carried out by a competent, trained person who has the necessary skills, knowledge and accreditation to carry the work out. Maintain plant and equipment regularly. With regular use and referral to the manufacturer’s maintenance instructions as a guide especially if routine work needs to be carried out on a regular basis. Put in place procedure to allow workers to report damaged or faulty equipment. Make sure you provide the maintenance worker with the right tools for the job. Schedule maintenance so that working time is as uninterrupted as possible and there is no risk to on site workers. Ensure maintenance is done safely. Make sure machines and moving parts are isolated or locked, that power is off, and any flammable/explosive/toxic materials are dealt with safely. Ignore any reports of damaged or faulty equipment. Carry on using equipment that is damaged. CJ Plant are a highly dedicated, skilled and professional team. We work from our custom-built workshop, with repair, testing and diagnostic facilities. All of our engineers are highly skilled and trained to a high standard. Their focus is on quality, ensuring that all units are repaired back to OEM standards. All the work we carry out comes with a twelve month written warranty. When we receive a unit, it is stripped and inspected free of charge. We then provide you with our report and our quote to repair. Can A Hydraulic Pump Be Rebuilt? What should I look for when choosing a hydraulic repair service?